The #1 Best New Way To Generate More Sales, Leads, & Traffic To Any Offer 24/7! In Under 5 Minutes You Can Have This Robot-Like Technology Working For You! 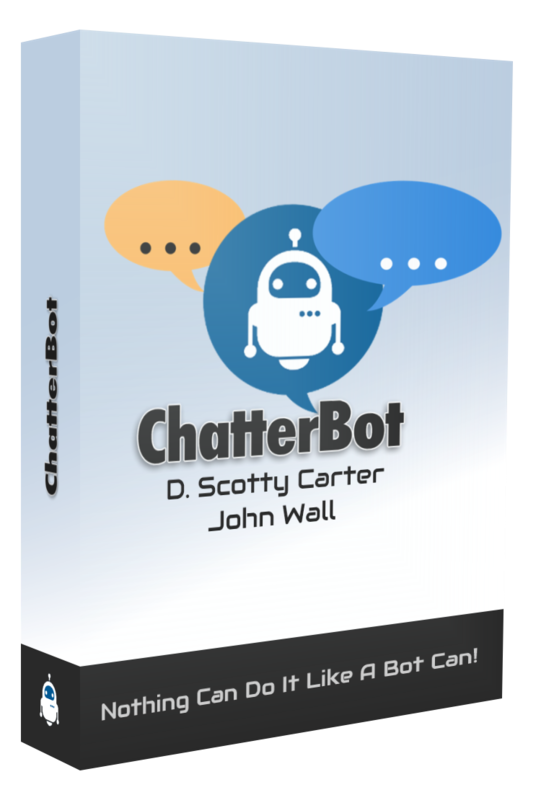 Get ChatterBot Unlimited Today For Just $147 $47 Today! Facebook Chatbots = Money In Your Pocket! ChatterBot Works for You Even While You're Sleeping! Completely Hands-Free! Internet marketing is really quite simple. If you put your message in front of your customers where they already are you will get results! Now your audience is using Facebook Messenger like never before, and ChatterBot allows you to reach your targeted prospects on autopilot! ChatterBot will engage with your customers on autopilot 24/7! Bots are much more than just a way to interact with customers! When set up properly you can turn your bot into a content delivery system that enhances your coaching programs 10X! Anyone that joins during this launch will get this special training FREE as a congratulations gift for being a part of ChatterBot! Tech Skills (or Expensive Freelance Coders) are NOT required to create winning chatbots! This is an online-cloud based software that was designed to be extremely simple to use. Unleash The Power of Facebook Chatbots With No Installation Required! The best part is that this software works on any device! It is all cloud-based technology that you can run from your web browser or even phone! Proof That Engaging With Your Audience Counts! Over the years online we have discovered that you can generate real sales, commissions, and income when you engage with your following! ChatterBot gives you the ability to create a new and innovative way to engage with your audience! These are just some examples of earnings we have generated thanks to the power of engaging with our audience! Do People Really Want to Chat With Robots? According to a SalesForce/Drift survey 37% of Americans said they would use a chatbot in an emergency. 35% would use them to resolve a complaint or problem. 35% would use them to get a detailed answer or explanation. 27% would use them to buy a product. 22% would use them to add themselves to an email list or news service! The studies show that consumers see chatbots as being able to provide the real-time answers and support they desperately want! Want To See Our Chat Bot In Action? In fact, you can integrate with 1,000+ popular apps! This integration means you can take your marketing to the next level easier than ever before! Remember you get ChatterBot today which offers you all of these amazing benefits for one low price! If you're not thrilled with this amazingly simple yet powerful landing page builder, lead manager, phone app, and training for ANY reason, just email me our support within 30 days and we'll cheerfully refund your money. You are in for a real treat today because you will get access to the unlimited license to ChatterBot plus the 6 bonuses mentioned above valued at $1,325! Let’s recap this amazing offer! This is a total value with the unlimited ChatterBot license of $2,322! We won't leave you to move on to our next biggest project. We want you to succeed and grow with us. Meet the dream team behind ChatterBot! There is a Rock Solid Team here to support you every step of the way!